Yamaha’s Sport Heritage bike building philosophy continues to move forward and evolve. Sharing its strong belief in respecting the iconic styles and designs of Yamaha motorcycles of the past, whilst intending to push the boundaries of motorcycle technology to create amazing bikes with real character that never compromise on riding ability. Yamaha called this new philosophy ‘Faster Sons’, a name that tips its hat in respect to the bikes that came before, whilst also showing pride in the faster sons of today and tomorrow, because above all, we love to ride. The new entry-level NMAX features a dynamic new bodywork inspired by Yamaha’s high-end sport models, and combines edgy styling with strong acceleration together with easy manoeuvrability and remarkable economy. Aimed at younger and active city commuters who want a new kind of affordable premium scooter that appeals to the head as well as the heart, the new NMAX widens the reach of the Urban segment by blending high-end design with day-to-day practicality. The NMAX’s compact and sporty chassis gives stable handling with ample agility. And for strong acceleration with low fuel consumption – 45.7km/litre WMTC mode – the new 125cc 4-stroke engine features variable valve actuation (VVA) with an efficient fuel injection system. Yamaha is very pleased to announce that it has added the cost effective range of BS Batteries to its Genuine Yamaha Parts line-up and they are now available through its Authorised dealer network for all Yamaha models. The winter period is typically a time when a lot of Yamaha owners have put their motorcycle into hibernation until spring when the weather improves. However, whilst this may avoid the inevitable impact of the seasonal conditions on external parts of a motorcycle, one component that can often be over-looked but will degrade over time if not suitably maintained is the battery. 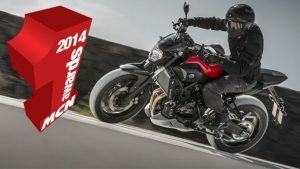 Widely recognised as the most prestigious awards in motorcycling, the 2014 MCN Awards have finally been announced with two different MT models scooping the top prize in their respective classes – with the new MT-125 voted Best 125cc machine of the year and the MT-07 declared as the winner in the Best Naked (middleweight) category, whilst also being chosen by the distinguished judges as the MCN Overall Machine of the Year 2014. Winning any of the annual MCN awards is always an honour but to receive the top prize confirms that a new motorcycle is something rather special. YAMAHA MT-125 Don’t be afraid of the Dark! Yamaha’s recently launched MT-09 and MT-07 have powered to the top of the sales rankings and captured the imagination of European motorcyclists who are looking for a new kind of riding excitement. Inspired by the Dark Side of Japan, these edgy new MT models are all about pure riding emotion. For 2014 Yamaha expand the MT range even further with the new MT-125 – its first streetfighter-style model in the 125cc category that aims to open the MT World to younger riders. The 2014 Wheels & Waves event in Biarritz went down a storm two weeks ago with thousands of dedicated custom bikes descending on the French coast to enjoy sunshine, good times and beautiful motorcycles. Yamaha were there in style with a showcase of stunning Yard Built creations from a host of builders including The Bender Brothers, Deus Ex Machina, Wrenchmonkees and Roland Sands. Aside from the already announced bikes, two special new machines were unwrapped at wheels & Waves for the assembled custom enthusiasts. The German Bender brothers Christian and Raphael took the covers off their first Yard Built Yamaha project, the über cool SR400 ‘Homage’. The brothers are huge fans of the Yamaha XT500 and took that as their inspiration in building the ‘Homage’. Motorcycle fans have a lot to look forward to on top of warm sunny days this summer as Yamaha steps up its iconic ‘Yard Built’ activities with exciting new projects. The Gibbonslap kit is now ready to order for the SR400 and the next few months will see new Yard Built XV950 and SR400 based projects by cult customisers. Yamaha will have a major Yard Built presence at the world’s coolest custom bike show, Wheels & Waves 2014 in Biarritz where some surprising customised SR400’s will be revealed! Yamaha offers a wide choice of urban scooters that combine style, fun and convenience. With its modern design, lively performance and masculine appeal, the new Majesty S joins the high wheel Xenter and the more feminine retro-style D’elight to complete the Yamaha 125cc urban scooter segment. Yamaha’s urban scooters are specifically designed to enhance the daily commuting experience by offering Japanese quality, advanced design and class-leading reliability with an affordable price. As well as the added satisfaction that comes with owning a premium brand, Yamaha customers can also be assured of a first class spares, service and warranty back up from our comprehensive European dealer network that is on hand to offer friendly and professional advice. 35 years heritage. Built to customize. Anyone who was old enough to ride a motorcycle in the 1970s will remember the fanfare that greeted the launch of the original Yamaha SR models. Inspired by the dual purpose XT500 which was launched a few years earlier, the single cylinder SR400 and SR500 were announced in 1978, and went on to become some of Yamaha’s most popular and enduring models. The handsome new Yamaha XVS1300 Custom is a new breed of cruiser that combines a classic raked-out ‘chopper’ style chassis with a gutsy liquid-cooled V-twin engine to create something very special. Attention to detail on the XVS1300 Custom is outstanding, with features such as the steel fenders, 21-inch front wheel and cooling fins accentuating its timeless good looks and reinforcing its authentic appeal.